Bonus star for cameos by characters from modern classics and amusing details that give it plenty of reread potential (like the different bills, and the revelation that the Wolf smokes a pipe, which we can conclude contributes to his huffing & puffing). An e;lderly big bad wolf really wants to go to that party so his friend mr alligator tells him how to behave. It's amusing and charmiong. Not a lot of big laughs but very likable. Very different artstyle than most. Pleasant almost rustic. I do like where the story goes. B.B. Wolf brushes up on his etiquette because is invited to the library for tea. The other storybook characters who come for tea are apprehensive because B.B. Wolf has a reputation for being big and bad. However, everyone is pleasantly surprised at his good manners. It was a nice story, with a clever little rhyme at the end that children can memorize, but it lacked something. Don't know what. I wasn't crazy about the illustrations--maybe that's it. I'll try it out at story time and see what the kids think. I liked the story. The ending made me wonder--did the librarian's cookies come to life? And didn't he just say he couldn't eat one? Other than that, the story made me smile a bit. Mostly from the humor that could be found in the illustrations. Might work in storytime? Perhaps best for school-age than preschool since they might get the humor better. A fun book to read aloud with your younger children. It reinforces good manners in a friendly, repetitive way without being too preachy. And the illustrations include characters from many fairy tales, and our girls liked to point them all out. I've been a Sierra fan since receiving her penguin book as a Christmas present in 98. And for whatever reason, abbreviating "Big Bad" to B.B. is hilarious to me. The Big Bad Wolf is invited to have tea but first he must learn some manners. The story was interesting and my daughter really enjoyed the illustrations. Overall a good read. Would recommend. This book is an excellent tool to teach children good manners, kind words, and how to treat others. A listserv recommended this while discussing gentle ways to inform a preschooler that putting his hands down his pants is not acceptable at school. In terms of that idea, this book is going to be a failure. Any child of that age will get the message loud and clear about "excuse me!" but I don't think they will make the mental transition to the behavior in question. However, leaving that issue out of the judgement of the book itself, this is a delightful story! BB (Big Bad) Wolf has received an invitation to a party at the library! His friend Alligator reminds him to remember his manners and say excuse me after a burp. Of course once at the party, which BB really enjoyed, the inevitable happened. BB cannot remember what to say! With his stomach gurgling away, BB races over to the computer, looks up etiquette books, races over, grabs one and scans frantically for the right word! He finds it and says it proudly and loudly, with other attendees rather puzzled. Then kaboom! out comes the burp which did NOT blow the library down! The librarian congratulates him on his remarkable manners, noting that he had said the magic phrase BEFORE the offending act and all ends happily ever after. This was a real delight. It looses the fifth star for not err, blowing me away with how wonderful the story was. But otherwise this is a marvelous story. BTW in spite of everyone's expectations, BB never does do anything bad in the story, so some kids may be slightly disappointed by that but the story is so much fun, they will get over their disappointment really fast! The Big Bad Wolf is now old and living in the Villain Villa Senior Center, is invited to a tea party by a children's librarian. His best friend, a crocodile, warns him that he will have to mind his manners. B. B. Wolf makes up a song: "Sip your tea and never slurp, say 'excuse me' if you burp. Smile and have a lot of fun, but don't go biting anyone." He remembers to say "please" and "thank you," but when his stomach starts to gurgle, he gets a little mixed-up about what to do when you burp. This is a hilarious read-aloud story that is a reminder for children who are still learning their manners. This is a great picture book for 3 to 5 year old children. It is fun, and educational all in one book. The illustrations are great and it is very humorous. This would be a good book for all children but age appropriate for 3 to 5 year olds. The theme of the book is manners and the characters of the book are all of the characters that the big bad wolf use to scare and his new friend, the crocodile. I'm working on creating a booklist for my local public library. This book was one in consideration for this list.This will be going on my manners booklist. It follows the story of Big Bad Wolf, and his being invited to tea at the public library. Before he goes, he convenes with his other "bad guy" friends to discuss what it will entail, going to tea. They teach him to make sure he sips, not slurps, says excuse me, and talks with people in order to have fun.It was a well done exercise in teaching manners without seeming like it was trying to teach anything at all, therefore, it's also an adorable story. Each page has several things going on, several story book characters, so it too would be great for classroom projects, or storytimes. B.B. Wolf is invited to a library tea. His friend the crocodile gives him a few etiquette tips to help him do his best at the tea. B.B. Wolf, despite a few little blips, manages to do his best at the library and promises the librarian that he'll return to tell his side of the story. Cute! It's a nice story to use to talk about etiquette and how school rules are also media center rules. I wish that the plot flowed a bit more smoothly and that the characters were a bit more developed. Kids will get a kick out of B.B. Wolf's burp and effort to do his best in a new situation. Recommended for kindergarten and grade 1. This is a pretty popular title in my elementary school collection because the humor is very accessible. This books gives a cute spin on the tale of the Big Bad Wolf, or B.B. Wolf for short. B.B. Wolf is invited to a tea party with other storybook characters but he doesn't know the right manners. His friend crocodile helps him practice his manners. The other storybook characters are very impressed and realize that B.B. Wolf is not the same wolf from the other stories. This would be a great book to introduce young preschoolers or kindergarteners to manners and politeness. The author even makes up a little rhyming song for manners. Funny little story. I used it my first day of library class with my 5th graders. Great lead way into library etiquette which is always a helpful reminder for the 5th graders! They really enjoyed making connections to fairy tales they knew. The story elicited many laughs and just proves that picture books really are Everybody books. I would definitely use again next year. It sparked a rekindling of interest in fairy tales for many students and several couldn't wait to hear Sierra's other BB Wolf story, Tell the Truth B.B. Wolf. Okay, so I am a librarian, but I love this book! The Big Bad Wolf gets invited to a storytime tea at the local library. Of course he is just going for the free cookies, but he does try to brush up on his manners before he goes. I love the modernization of the classic fairy tale characters. I could spend hours looking at the illustrations. The details are hysterical. Each time you read this you will see something new. Wonderfully done! The big bad wolf has retired! Now he is working on his manners so that he may join the tea party at the local library. This book is so much fun to read and children will love the twist to the big bad wolf they thought they knew! The illustrations are wonderful and will keep kids busy as there are so many different things going on on each page! This is a read for pure pleasure, but it also allows you to have a discussion on manners and explain the term etiquette. This was a fun story with a little bit of repetition that children love. Mind Your Manners, B.B. Wolf is perfect for second or third grade readers and is filled with lots of great illustrations. Not only is it entertaining, but it teaches children to think twice before judging someone based on their reputation. I really enjoyed reading this book and think it can be used in the classroom for several fun activities. 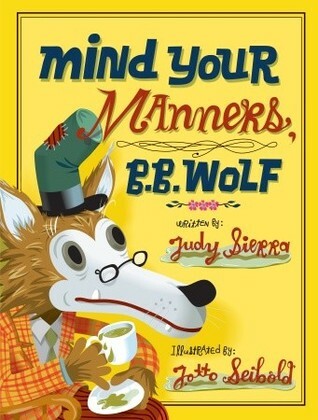 A good, humorous book to read to children about manners. BB Wolf is invited to an afternoon tea with friends. He has to brush up on his etiquette and learns to sip his tea and say excuse me. All of the classic fable characters attend tea, such as, little red riding hood and the gingerbread man. BB Wolf hilariously says excuse me before he burps. He burps so loud that he almost blew down the library. I love how "the wolf" is portrayed as the good character in this book. This was a great book that was all about manners; and about how Mr. Wolf acted in storybooks was not true, he was actually quite polite. I would recommend this book to those looking to introduce manners in a fun, new way that children will enjoy. TO READ: During Toddler Time, Preschool, Kindergarten and First Grade school visits.Read during Preschool Play on December 1, 2017. B.B. (Big Bad?) Wolf gets invited to the library for a special tea time. He rehearses his manners, and deals with an extremely nice librarian (of course). He even runs to look up "etiquette" using library resources so that he will remember what to say if he burps. This has funny side jokes for older readers and bold graphics. I really loved this book! It incorporates a lot of well known fairy tales involving the "big bad wolf" such as "The Three Little Pigs", and "Little Red Riding Hood." This is great for text to text connections. The book also has rhyming throughout which could be great for lessons. This story can also remind students to be polite and use your manners. L got this for Christmas and loves it - he sings along with the wolf's manners song when we read.and of course love the Siebold illustrations (he has Olive the reindeer too) ...I think he'll appreciate it even more when we read more of the backstory fairy tales (Red Riding Hood, 3 Little Pigs) - been a while since we'd read those. This is a goofy tale of the Big Bad Wolf trying to fit in long enough to have afternoon tea at the library (he heard there would be cookies). The art is bright and clear and charming and the goofy songs he makes up to remember his manners inspired my children to chant (and write potty talk parodies of it). This would be a fun book to read with The True Story of the Three Little Pigs. It tells the story of the infamous Wolf and his trip to the library where he learns to be polite.The pictures are interesting cartoons in bright colors. Older readers will find the subtle details and fairy tale references in each illustration amusing. If you need a book about manners this is the book for you. It is a great book to use if you are planning on having a manners discussion with your class. It is also a good book to give an example of how to remember information. Explain to your students that making up a song like B.B. Wolf is a fun and great way to remember things. Can I just say that I have not read a Judy Sierra book yet that I didn't love. This is a great and hilarious tale of B.B. Wolf going to a tea party at the library. He learns about etiquette because he wants to be polite, and make quite an impression. I loooooooove this story! So funny, and great art work too, along with references to popular fairy tales that kids will know. Judy Sierra J. Otto Seibold - I took a roundabout path to becoming a children's author. Out of college I did temporary work in offices and libraries, while at night, I wrote poetry and made strange life forms from cloth. When I teamed up with a puppeteer, Bob Kaminski (my husband), I was able to bring my cloth creations to life. We began performing on the streets of San Francisco, at Renaissance fairs, and at schools. After attending a workshop on Balinese shadow puppetry, we traveled to Bali and Java to learn ancient techniques from modern masters, and we adapted material from American folklore to the shadow screen. I became so fascinated by the power of ancient myth and folktale to engage a modern audience that I enrolled in the Folklore and Mythology Program at UCLA, where I received my Ph.D. While I was a student there, I attended a talk by the author-illustrator Uri Shulevitz, and heard him say that a picture book is like a small theater. A puppet theater is also a small theater, I thought. I can do that! My first children's books were adaptations of folktales, and soon, I was able to incorporate my lifelong habit of writing poetry into my work.Currently (2018), I live in Portland, Oregon, with my husband. I divide my writing time between children's books and a long term project on folktales, grandmothers and cultural evolution.